Turtle Journal visited the tip of Shirttail Point this afternoon to check on the lethargic juvenile harbor seal that has been resting in this area of Wellfleet Harbor for more than a week. (See previous Turtle Journal articles below.) The tide was rising and would soon reach its flood in about two hours. Waves were already rolling over this sad seal, which would soon be engulfed by the rising waters. IFAW Marine Mammal Rescue team is monitoring this juvenile seal and has posted signs alerting the public to keep away and to avoid disturbing this animal. 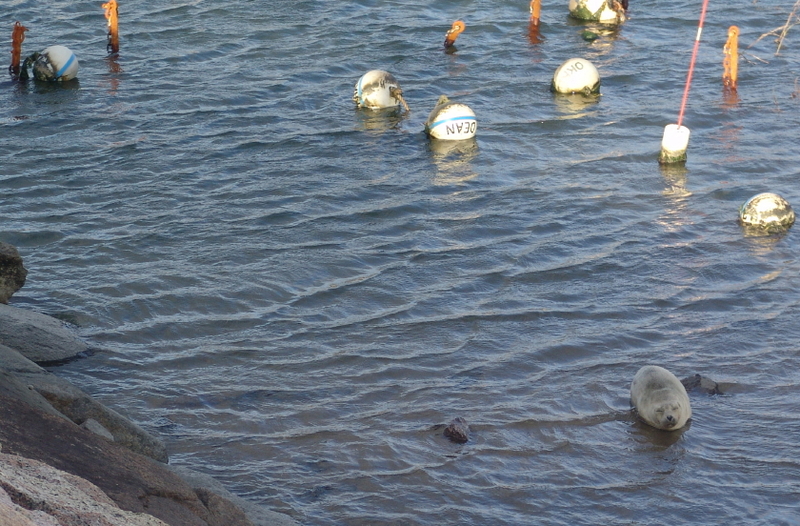 The picture above is from Friday’s low tide in the same spot where the seal was found again today. 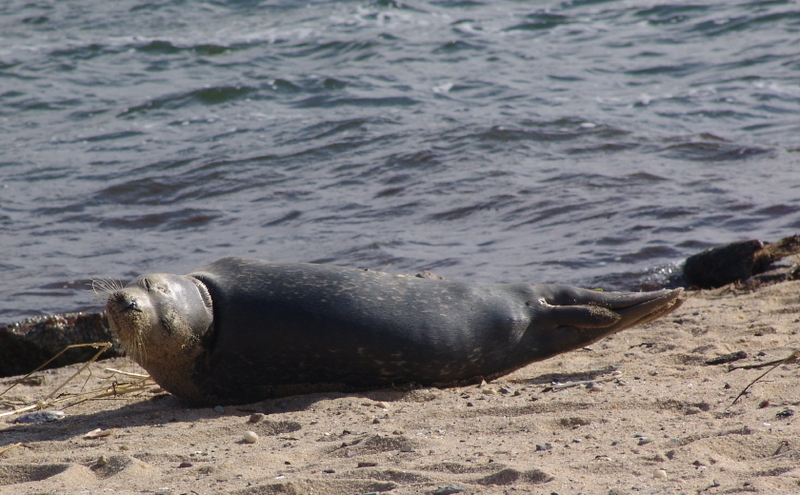 The edge of the Wellfleet Pier (Shirttail Point) offers a sandy resting spot for this young seal between high tides. As the new moon arrives this coming weekend, tides will rise over 12.5 feet and this area will fall several feet under water. 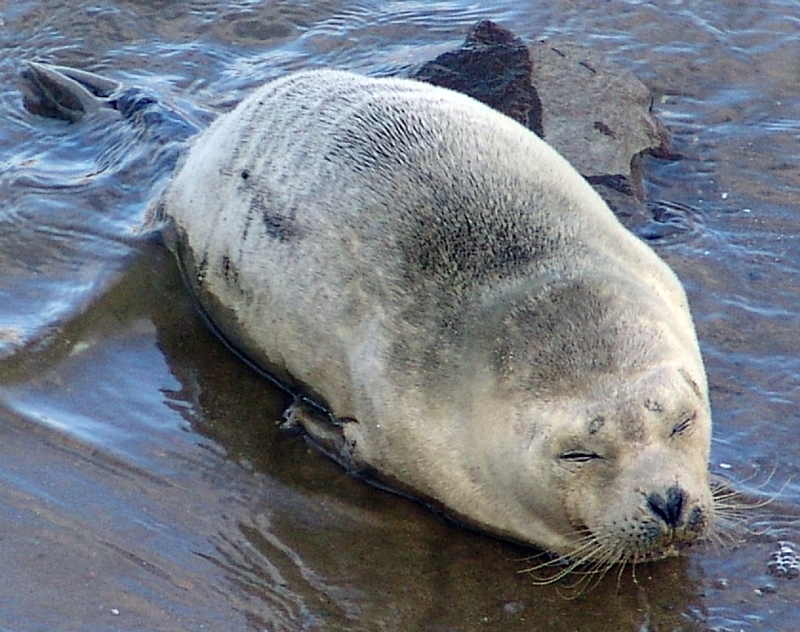 It is possible that these astronomically high tides will cause the ailing young seal to move to a new location. Turtle Journal will be co-leading a Stranding Weekend Program at Mass Audubon’s Wellfleet Bay Wildlife Sanctuary. Participants will keep a weather-eye for this animal if it moves from its current location. 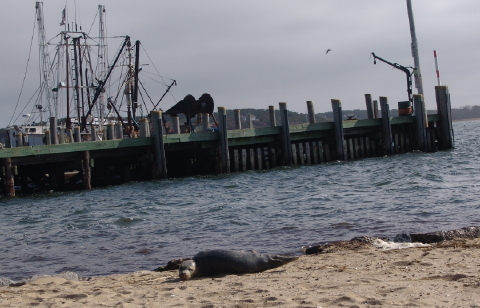 Harbor seals are frequent fall visitors to Wellfleet Harbor, where adults can often be observed chasing schools of menhaden and hauling out on the floating docks of the Inner Harbor. 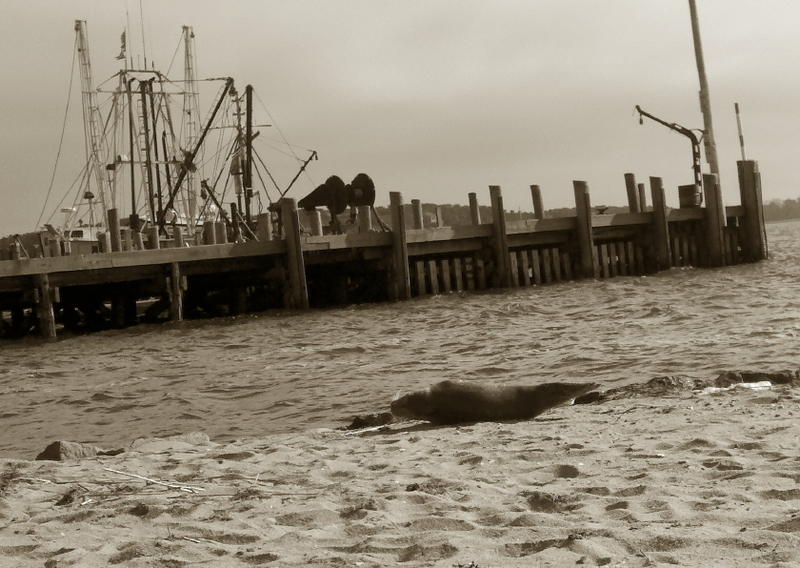 (See Ode to a Lazy Seal and Wellfleet Harbor Seals Return for Halloween.) Yet, this small lethargic juvenile seal seemed out of sorts and out of place when Turtle Journal encountered it on Tuesday afternoon. 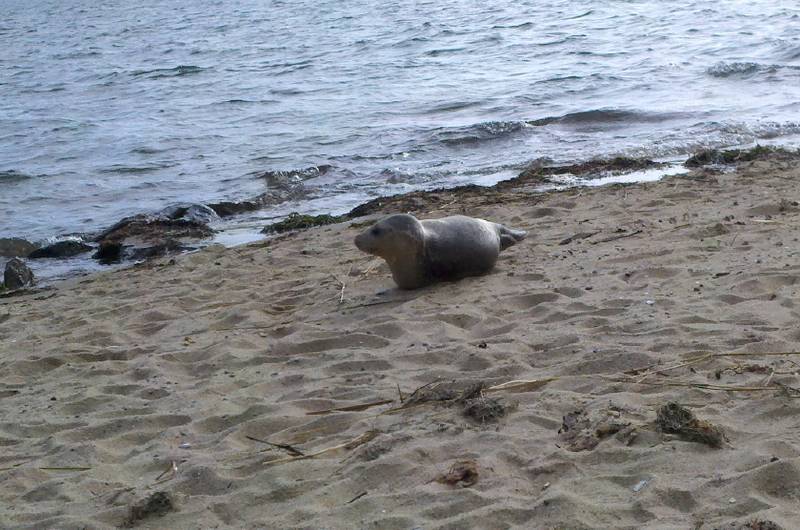 The seal had taken refuge on the sandy beach just off the working fishermen’s section of the Wellfleet Pier. When Sue Wieber Nourse spotted the juvenile, it lay quite motionless on the warm sands heated by 60 degree late October sunshine. 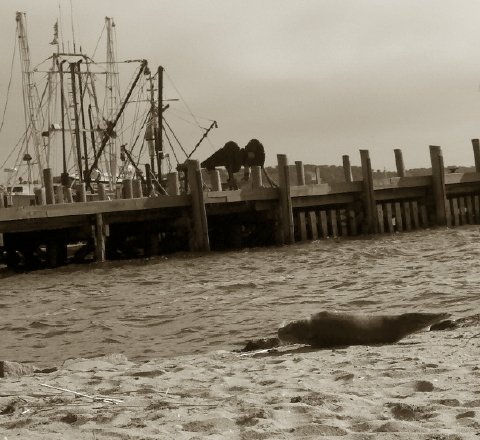 Since marine mammals are federally protected, Sue ensured she did not disturb the animal by staying a significant distance from the critter and photographing the event with telephoto magnification. As Sue filmed a short clip of the basking juvenile, some tourists approached within 50 feet of the animal and it began to respond to their presence. After they were waved off, the harbor seal resumed its patient wait for the tide to envelop the warm sands on which it had hauled out. 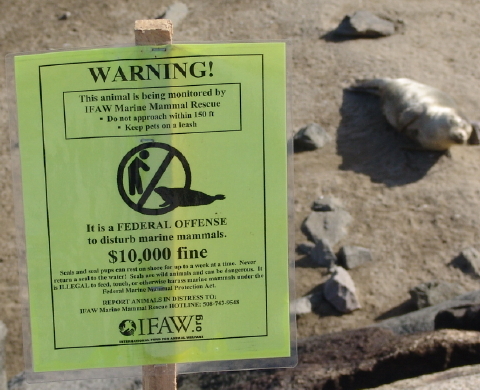 Turtle Journal alerted the marine mammal stranding network that said they had kept this seal under observation at this spot for the last 24 hours. As Turtle Journal left Wellfleet Pier, the juvenile harbor seal seemed to be snoozing as the tide continued to rise. 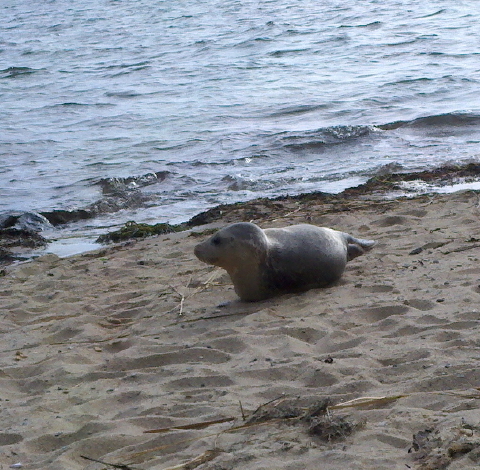 When Sue returned to the pier later in the day, the young seal had disappeared with the now receding tide. 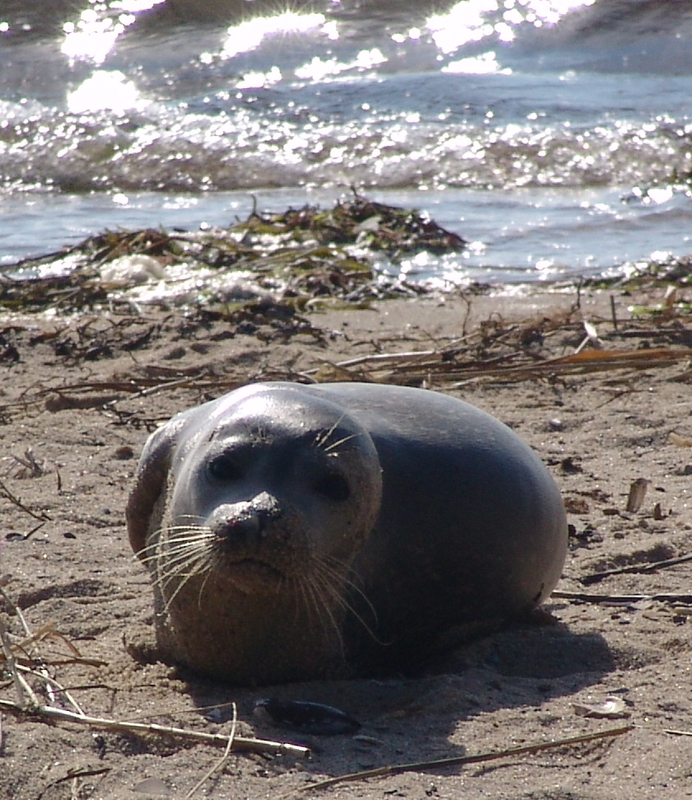 Sue Wieber Nourse of Turtle Journal discovered a small, juvenile harbor seal on the beach just west of the fisherman’s pier in Wellfleet Harbor early this afternoon. The animal appeared quite lethargic when Sue first arrived on the scene. After a few moments the juvenile seemed to perk up a bit, yet continued to bask on the beach. We reported this seal to the marine mammal stranding network (IFAW) and were told that it had been observed at this location for at least 24 hours. Volunteers from the stranding network were checking the animal periodically. Should you find a marine mammal on a Cape Cod beach, do NOT disturb the animal. They are protected by federal law. Instead, report the observation to the stranding network at 508-743-9548 … or you can always call the Turtle Journal 24/7 hotline at 508-274-5108. Turtle Journal regularly surveys the dock fouling flora and fauna in Sippican Harbor in search of new species and bio-invaders that may have moved into our local shoreline communities. We were surprised this week to discover a nuisance green algae flourishing along the floating docks at Marion’s Town Landing in Sippican Harbor between Tabor Academy and Burr Brothers marina. This lush green seaweed called Bryopsis comes in two-dimensional Christmas tree shaped (pinnate) fronds. What’s stunningly interesting about this species is that each two-to-six centimeter long ”feather” is a singular unicellular organism! 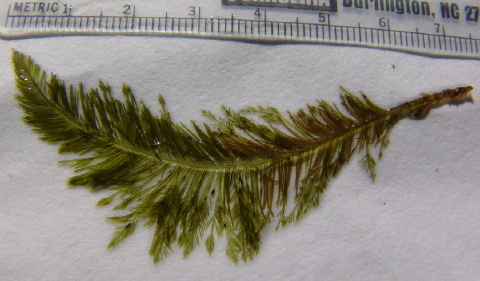 Bryopsis sp. ranges in protected shallow waters from tropical to temperate climes. Frequently considered a nuisance species in the wild, Bryopsis was commonly used in aquariums and has been know to “escape” into the natural habitat and to overwhelm native species. Its unique unicellular organization, combined with an ability for both sexual and asexual propagation, allows for rapid evolution and adaptation. Species can change so rapidly that morphology (shape) alone cannot be used for identification. Scientists opt for DNA analysis to differentiate species. 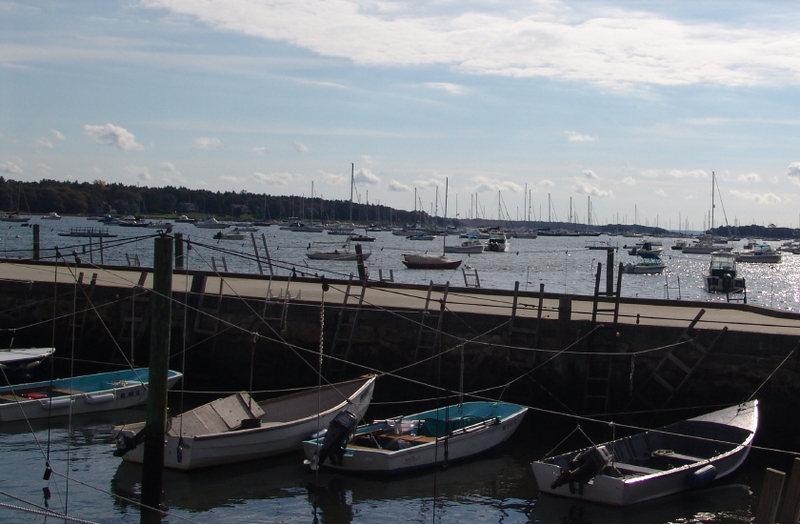 Many times each year, we stretch out on the floating docks along the west shore of Sippican Harbor to sample the fouling communities that have accumulated through the summer months. The extent of vibrant green colors congregating just below the waterline immediately caught our attention. 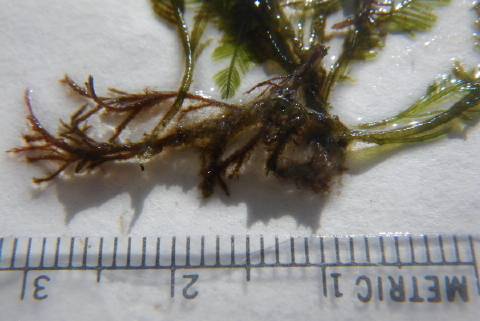 Sue Wieber Nourse, who has been surveying and documenting Marion shoreline specimens for fifteen years, noted she had not seen this species in Sippican Harbor previously. Yet, Bryopsis had proliferated all along the waterline of the town’s floating docks. This nuisance green seaweed thrives in nutrient rich water containing elevated nitrogen levels, as has been reported in Sippican Harbor. 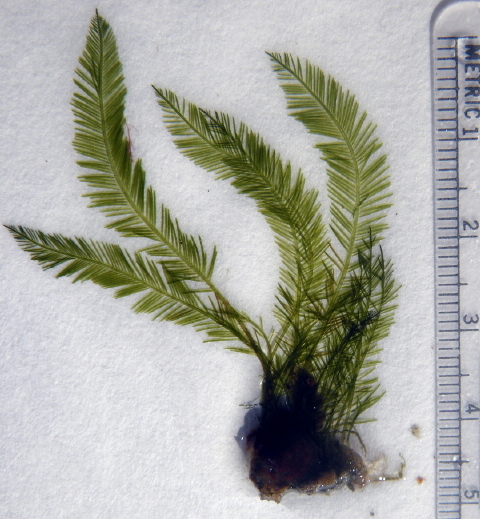 The specimen above illustrates the size and shape of the pinnate fronds, although the rhizoids of this organism are encased and hidden in a tunicate. Bryopsis has been described as a beautiful feather-like siphonous green algae. The “stem of the feather” (central axis) is called the thallus with symetrical fronds on either side. From the specimen above, you can see that the fronds are bipinnate. This “feather” represents one of the longer specimens we observed in Sippican Harbor at six to seven centimeters length. A factor that allows for proliferation of Bryopsis in the wild is the ability of this organism to produce a foul tasting and noxious protein that wards off predators. It generally out-competes other algae and seaweed for space, light and nutrients. 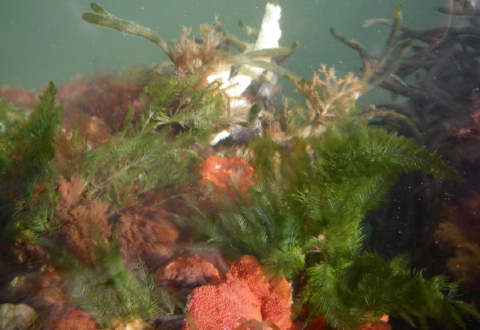 Bryopsis is related to another nuisance green seaweed called Codium, which is a highly invasive species within the Massachusetts coastal community. Examining Bryopsis from stem to stern, we reach the rhizoids (also know as its “Holdfast”) that anchors the algae to the dock and the fouling community. 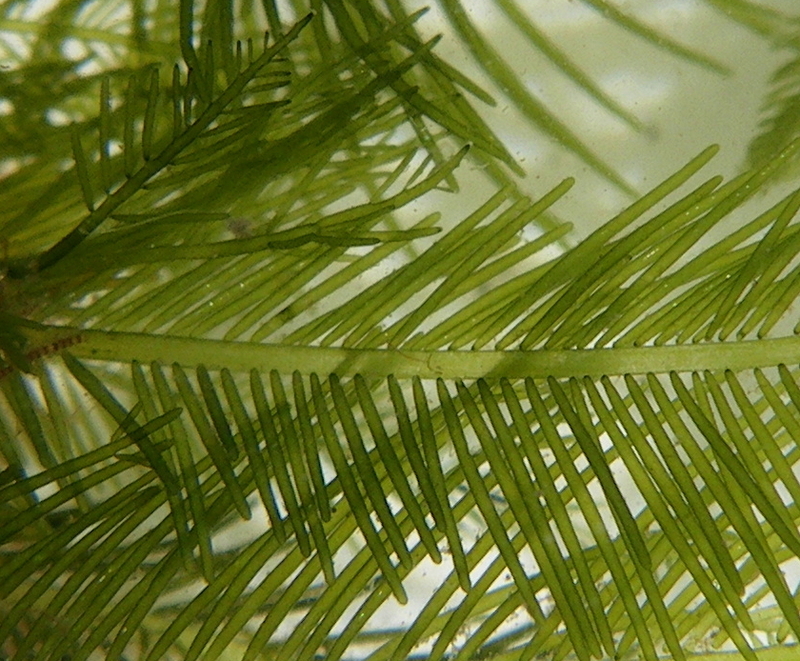 This close-up photograph of Bryopsis, which can be enlarged by clicking, illustrates the unicellular nature of the species and the lack of cell walls within the thallus (body). This unicellular aspect can become a vulnerability when the organism is injured and the cell wall is breached, yet Bryopsis sp. has evolved a way to heal itself when the membrane is punctured. Clotting agents (proteins) are released at the site of injury and within 15 – 20 minutes a healing, gelatinous envelope forms at site of injury. Taking a look back in time at the same fouling community and the same floating docks from two years ago, we can clearly see that no Bryopsis sp. was observed in our October 2008 survey. The source of this nuisance seaweed in Sippican Harbor can only be surmised. Bryopsis sp. 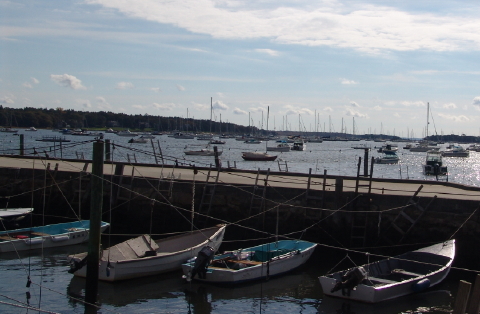 has been known in coastal Massachusetts. Whether Sippican patches developed from an escaped local aquarium or lab, or whether they floated in with the tide is unknown and may never be known. Turtle Journal will, however, continue to sample the Sippican shoreline to determine the extent of its presence in the estuary. You are currently browsing the Turtle Journal blog archives for October, 2010.